“Nobody knows what it is,” is the verdict of Zimbabwe’s former trade minister and now opposition politician Nkosana Moyo. He was talking about what appears to be a new currency in the country. It has been introduced over the last few days but its impact is not yet clear. Zimbabwe has a troubled history with currency. In 2009 it ditched the Zimbabwe dollar and adopted the US dollar after hyperinflation destroyed its value. At its height prices were almost doubling every day and the reserve bank printed notes worth 100tn Zimbabwe dollars to try and keep up. But because more US dollars were leaving the country – in the form of payments for exports – than coming in, US dollar cash was in short supply. This led to long bank queues as people struggled to get their money out. In 2016, the government introduced bond notes and coins, which were supposed to be worth the same as the US dollar, to make up for the cash shortage. But no-one had faith that they were equivalent and, on the black market, bond notes have lost value against the dollar. And now the government has introduced the Real Time Gross Settlement (RTGS) dollar, which is being described by some as a new currency. It’s not a phrase that exactly rolls of the tongue, but it is an acronym familiar to Zimbabweans who have been using it to describe money that has been electronically transferred into their bank accounts. 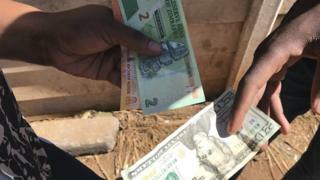 As well as paying for goods in US dollars, Zimbabweans have been able to use other foreign currencies such as the South African rand, plus bond notes, debit cards drawing on bank accounts and money stored on a mobile phone app. But each of them had a different exchange rate, meaning that customers were sometimes charged different prices depending on what payment method they chose. The RTGS dollar is supposed to bring together bond notes and debit card and mobile money payments to make sure that they are all worth the same. Significantly, the government has given up on the pretence that the bond note and the US dollar have the same value. Now it is saying that the value of the RTGS dollar against the US dollar will be set by the market. What makes a currency a currency? While business journalists and commentators are saying that there is a new currency, the government has not used this phrase. The Zimbabwe dollar has such a tarnished history that the government is reluctant to be seen to be returning to this. At its simplest, a currency is something that is widely accepted as a means to buy goods and services. From now on the government wants things priced in RTGS dollars, rather than US dollars, and people should be able to use the various payment methods denominated in RTGS – debit cards, bond notes and mobile phone money – to purchase them. So it feels like a currency but there are no plans to have notes and coins with “RTGS dollars” written on them and you cannot use them outside the country. How much is an RTGS dollar worth? The government has said it wants the price of the RTGS dollar to be determined by the market. It initially suggested that it should trade at 2.5 RTGS dollars to the US dollar, but this was significantly less than the black market rate for the bond note, which was selling at more than 3.5 to the dollar. If the RTGS dollar is truly allowed to float without intervention then the black market should be eliminated altogether. How will this affect the ordinary shopper? At this point it is not clear. The government hopes that it will make things simpler as there won’t be different prices quoted according to the various currencies and payment methods. It also hopes that prices will stay the same or even decline as stability and predictability is brought into the market. Will this solve Zimbabwe’s problems? Zimbabwe has been hit by rising inflation and increasing levels of government debt for many years. But if the RTGS dollar is the solution, then the government is “misdiagnosing the problem”, opposition politician Mr Moyo says. He argues that poor economic management is at the heart of the problem, saying that government expenditure needs to be reined in. But Finance Minister Mthuli Ncube insists that austerity measures he introduced in last year’s budget are working and government revenue is increasing. As long as the government does not try to manage the RTGS dollar exchange rate, then this is a step in the right direction, says the chief economist at Renaissance Capital, Charlie Robertson. But given the history that Zimbabwe has with currencies, it will take a lot to restore people’s trust, he adds.